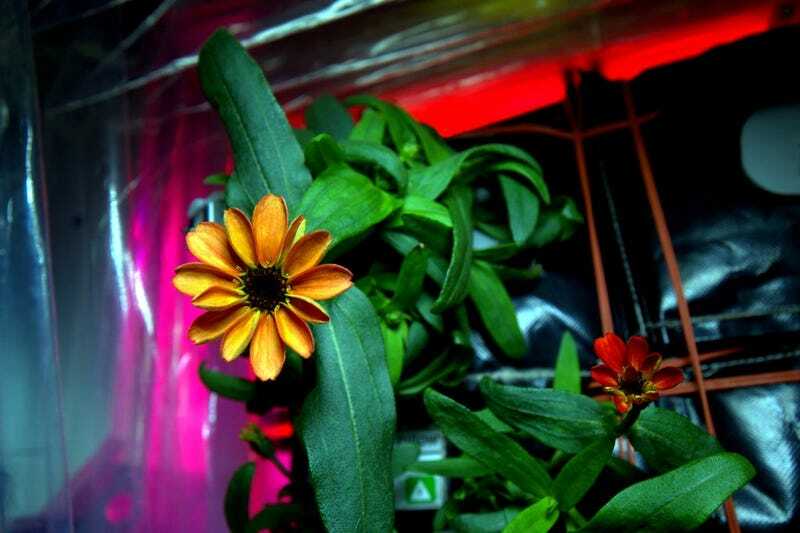 The first zinnias are blooming in space, but they almost didn’t make it from bud to flower. This is a story of how an experiment was saved by throwing out heavily regulated, detailed procedures in favour of using human judgement on the fly. 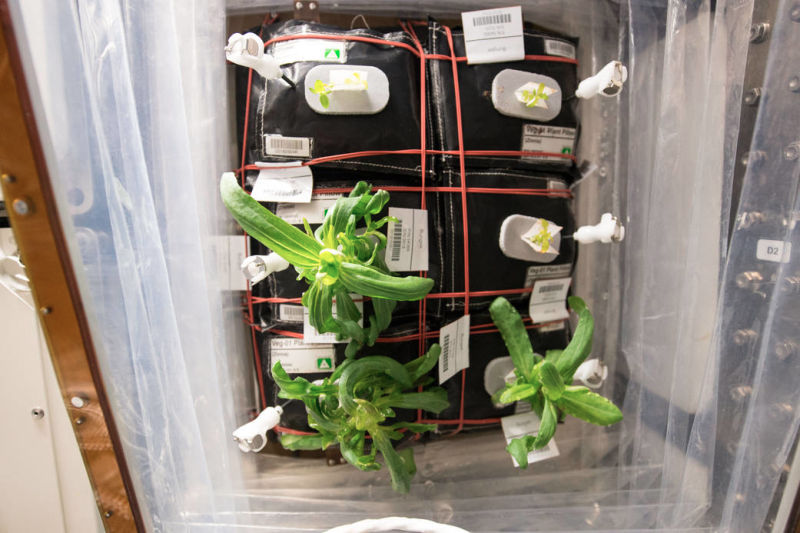 Astronauts grow edible plants in the Veggie facility on the International Space Station. It took them two tries to grow red romaine lettuce—they drowned the first batch—and it briefly looked like it would take them another two tries to grow a flowering plant. 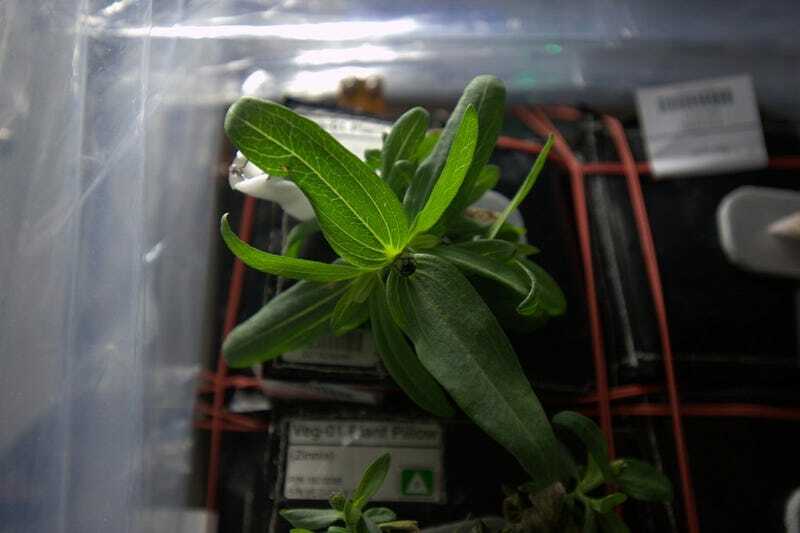 Two weeks after planting zinnias, astronaut Kjell Lindgren spotted water oozing out of the plant pillow wicks. He poked around and found that three of the plants were drowning in water. Ten days later, scientists looking at photos were horrified to see water droplets along some leaf edges, while other leaves were starting to dramatically bend and curl. The water droplets were a sign of high humidity, causing excess water to be forced out of leaf tips. The curling leaves were a symptom of flooded roots. Together, they were a sign of too much water and not enough air flow. Astronauts didn’t have time to fix the problem. They had an emergency spacewalk and couldn’t spend quality time with their plants, so they bumped the fan to high and hoped it would be good enough. But the plants couldn’t wait. Tissue was starting to die. Then they started to mould. Mould isn’t just a problem for the Veggie garden. In the limited air circulation of the space station, it’s also a potential health hazard for the crew. At the first sign of mould, NASA made a 4am phone call to the Veggie project lead investigator to fix this right now. Veggie head scientist Trent Smith was hauled out of bed early on December 22nd, 2015, and quickly assembled his team. Within four hours, they’d drafted new procedures for astronaut/emergency-gardener Scott Kelly. Equipped with a dust mask just in case, Kelly cut out the mouldy tissue and bagged it up for the freezer for later study on Earth. He sanitised all accessible surfaces with cleaning wipes. On Christmas Eve, Kelly reported new problems with his garden. Having the fan constantly on high to inhibit mold was drying the crops out too much, but the next scheduled watering wasn’t until the 27th. Instead of being annoyed at having his project taken over, Smith was ecstatic. He had a volunteer-astronaut willing to care for his plants personally instead of blindly following a pre-set chore list? Best Science Christmas Ever! The Veggie team scrapped their book of detailed procedures, and created a streamlined “The Zinnia Care Guide for the On-Orbit Gardener.” Instead of set schedules and procedures, it was a concise set of basic guidelines to help astronaut-gardeners use their human judgement. Kelly’s independent holiday gardening paid off. Two plants died, joining the mouldy leaves in the freezer for later study. But the remaining two plants thrived, not just surviving but growing new offshoots of buds. On January 12th, petals first started to peek out of the bud. Far earlier than the expected 7-10 days later, the world received the first photo of a flower grown entirely in space on January 16th, 2016. The near-failure of this crop of zinnias was a learning experience. How did the plants respond to the changing fan and watering conditions? Could an astronaut be more effective acting independently than locked into following automated procedures? And once the flowers bloomed, how would they be different than their terrestrial kin? Smith knew from the beginning the zinnias would present a challenge, even to experienced astronaut-gardeners. “The zinnia plant is very different from lettuce,” he explained in a press release. “It is more sensitive to environmental parameters and light characteristics.” Zinnias are not just more difficult to grow, but they also take longer—between 60 to 80 days from seed to flower. 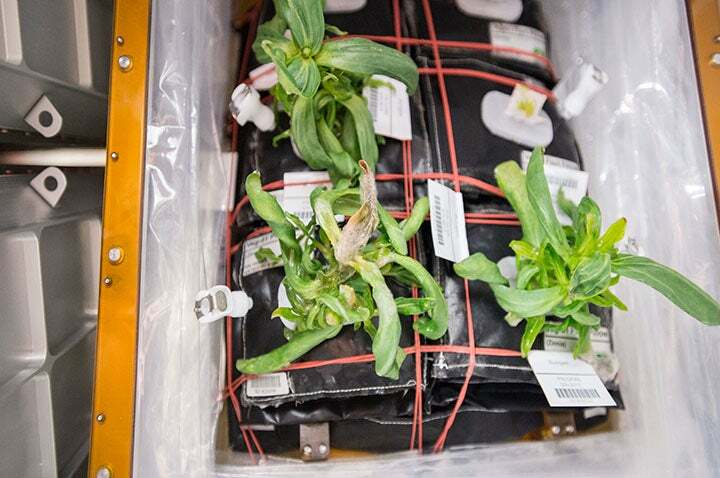 But they’re also scientifically useful plants, providing an introduction to flowers in microgravity and acting as a stepping-stone to eventually growing finicky tomatoes. This ability to switch crops yet build on prior experience is a strength of the Veggie growth facility. The science setup was installed on the station in May 2014. 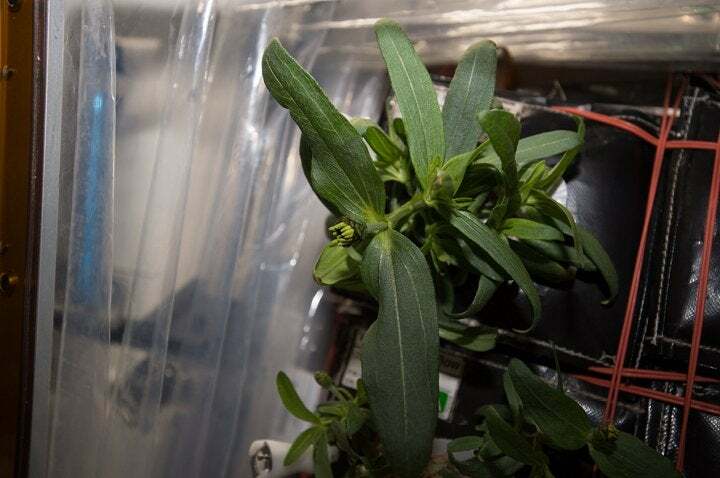 Now every new experiment involving growing plants in space can use the same design with new plants, and astronauts can follow the same basic procedures tailored for any special needs. This cuts down on both the economic and intellectual costs of continuing to experiment with growing food in space. The experiment isn’t done yet. The next SpaceX cargo run to the space station will carry more crops for Veggie: two sets of Chinese cabbage, and another set of red romaine lettuce. Looking even further ahead to 2018, the team hopes to grow dwarf tomato seeds.